Disclosure: I was sent this ARC as part of a giveaway. As always, my reviews are fair and unbiased. First Thoughts... When I won The Fandom as part of my prize from my newfound friend, Kate, on twitter, I was so excited. I wasn't able to attend YALC and snag an ARC myself, so when I won it, it was a dream come true. I mean, just look at that blurb. It's a story about getting thrown into a real fandom world. Isn't that the dream?! Or for some, maybe a nightmare? My Review... Violet can't wait to get to Comic-Con. Along with friends and her younger brother, they anticipate to finally get to meet the actors of their favourite fandom, The Gallows Dance. (Short note: I loved this concept. There are so many teens/young adults that love fandoms and it's never appreciated that much in literature). Despite the actors not being anything close to the characters they play, lifestyle wise, they're still eager to meet the fandom they're all obsessed with. But it's not going easy for Violet and her friends. After meeting their hero, they soon get thrown into the world they love. Like. . .literally. As in, they are in the fandom world they know so well. Everything comes crashing to a halt for Violet. Soon enough, they find themselves following out the plot as the timeline moves along as they know it. But with the option to change the fearful conclusions, Violet could change the world and risk her friends lives or do everything she can to get them out. Throughout it, we see so many YA Fantasy tropes and a twist on calling out certain over-hyped ones (major plus points) and how putting a contemporary set of characters into a dystopian world worked (brilliantly, of course). Overall, every single thing that happened in The Fandom was surprising, unpredictable and wild (in the best, best way). I was rooting for the characters as the plot played out, unraveling the storyline and hanging onto my seat in a carousel of amazement and adventure. The relationships between the characters were *perfect* and that's something that just gave The Fandom a little bit of an added edge for me. They were realistic and totally believable down to the sibling bond. Everyone has at some time in their lives been obsessed with something or a Fan of someone and I think that Anna has truly captured the essence of loving something so fiercely - and what can happen when everything goes wrong. I can't think of anything I didn't like about it - it's THAT good. A true must-read this year! 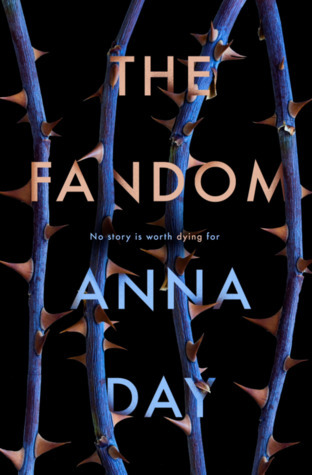 Have you read The Fandom?